Curls that aren't dried correctly quickly can become a tangled, frizzy mess. When it comes to your curls, knowing and utilizing correct drying methods can help keep curls defined and frizz free. Here are the best ways to dry your curls to ensure they look great all the time. This method will give you the best curl definition, shine and control. When your curls are damp, apply your styling products, scrunch out excess water and then allow your curls to air dry. Don't touch until they're completely dry to ensure you don't break up the texture. Use a diffuser attached to your hair dryer to help dry your curls faster and with good consistency. Diffusing also will give your curls a boost of volume, making it a great choice for those with curls that tend to fall flat. For best results, diffuse with your curls upside down. Not all curlies happen to have a hooded dryer at home, but inexpensive ones can be purchased from Amazon. This is a great way to get dry curls really quick or to help set your wash out, rollers or twist outs. 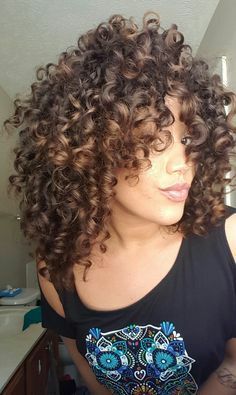 Use this technique to “accordion” your curls and wrap them into a t-shirt to dry while holding their shape. This technique provides defined curls, fast drying time and much less frizz. If you tend to have curls that dry flat, you can use metal duck billed clips to lift the roots while your curls dry. Once curls are completely dried, remove clips and shake out curls for increased volume. This technique probably isn't going to work super well for you during the colder months of the year, as your curls would most likely freeze. During warmer months, some curlies take off with wet hair and allow the natural air flow from their open car windows to dry their curls.